Bias: Fixed Bias w/ bias adjustment pot. Comments: The Pro was retired at the end of 1965. I love this amp! Such a great tone! These amps are overlooked sometimes for the tweed and brownface Pro. They are just as nice in their own way. I have a 64 and use a 64 C15N which sounds much better than the stock C15P or the 15″CTS. 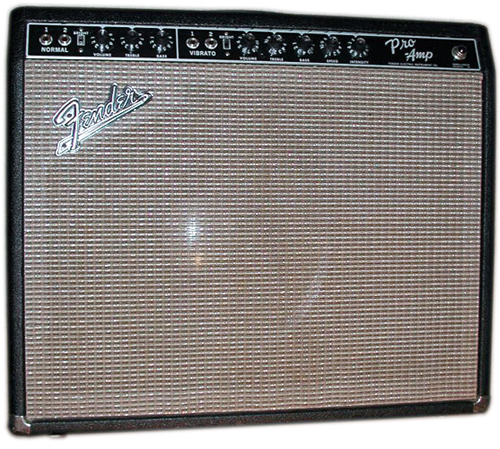 Fender should have used these because they will handle the 30 watts with ease and are more sensitive(louder) than the stock speaker. They did use the C15N in the 64 Vibroverb and it pushed the limits of the speaker with 40 watts but sounded great. These amps also went back to the GZ34 tube rectifier. A great amp with a couple of RCA 6L6GCs and a couple of nice RCA 7025s in V1 and V2 and the last of the pre CBS amps with a 15″ speaker along with the Vibroverb.